Over time, the surface of your deck or patio can become dull and dingy. Harsh weather, debris, pollen and various other factors can all prompt an outdoor cleaning session. With the right pressure washer accessories and a little guidance, your space can look fresh and tidy for the season. This guide will provide detailed instructions on how to use a pressure washer. Pressure washers use pumps to amplify water pressure. Choose from electric pressure washers or those powered by gas engines. Pressure washer pumps have two connection points for low and high pressure. The low-pressure connection (IN) is threaded to accept a standard garden hose. The high-pressure connection (OUT) accepts a pressure washer hose (typically M22 threaded or 3/8-inch QC) that connects to a hand-held pressure washer wand. A pressure washer pump is the most important component of your pressure washer. Axial pumps, best used for small jobs around the house, are easy to use and require little maintenance. Triplex pumps, ideal for daily or frequent use, need to be maintained but can be repaired to ensure years of quality performance. Interchangeable nozzles control the wand’s spray pattern. Most pressure washers include wands that use a ¼-inch quick connect system. Tip: It’s recommended that you apply a pump protector after every use. Pump protector will lubricate your pump’s seals and prevent the buildup of corrosive minerals and ice. Cleaning power is measured by PSI (pounds per square inch) and GPM (gallons per minute) rating. 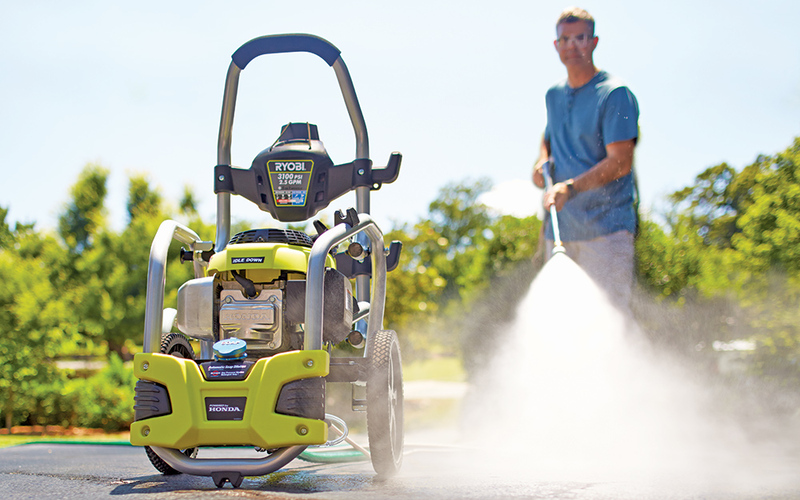 Tip: To determine the cleaning power of a pressure washer, multiply the PSI x GPM. The resulting number will help you compare models so you can choose one that will be up to the job. PSI: Pounds per square inch measures the pressure, or cleaning force, of water created through the pressure washer. Use the PSI rating to help you determine how powerful the water stream will be. GPM: Gallons per minute measures the volume of water delivered through the pressure washer. This number will help you determine how fast the pressure washer will clean, and how effectively it will rinse away debris. Consider the flow of your water supply and double-check the amps required to power the model you plan to buy. Well water may be incompatible with most washers because of low water flow. Check to see if the brushes, pressure washer nozzles and tips match the types of projects you plan to tackle. There are many attachments that are made for specific projects, including rotating brushes and extension wands for high cleaning. 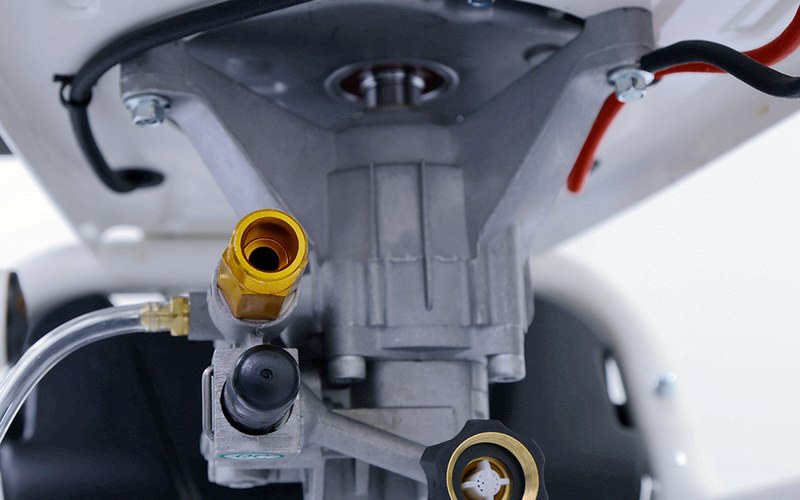 If your cleaning needs are more demanding, consider a unit that includes electronic fuel injection, or EFI. 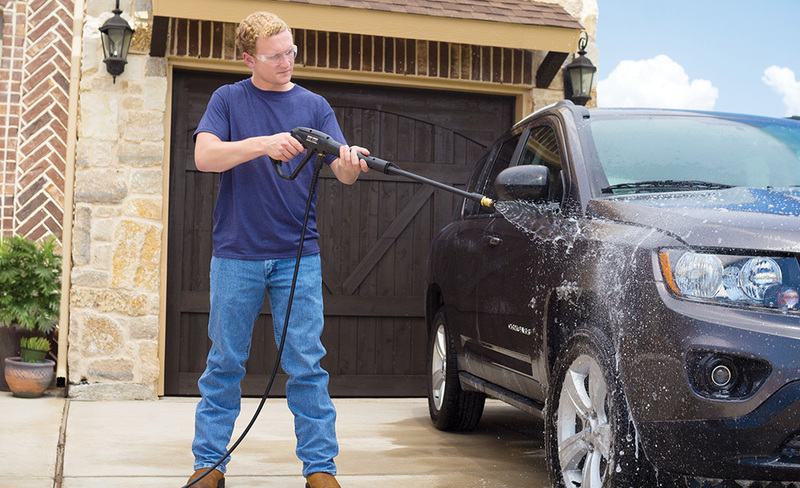 This feature gives the pressure washer 50 percent easier starting and better fuel economy. Pressure washers with the PWMA logo indicate that they have been certified by the Pressure Washer Manufacturers’ Association.